On 5 November 1605 Guy Fawkes was caught preparing to detonate 36 barrels of gunpowder under the House of Lords unveiling an act of attempted treason that shocked the whole of Europe. What led a group of young Catholic men to risk their lives for their faith? 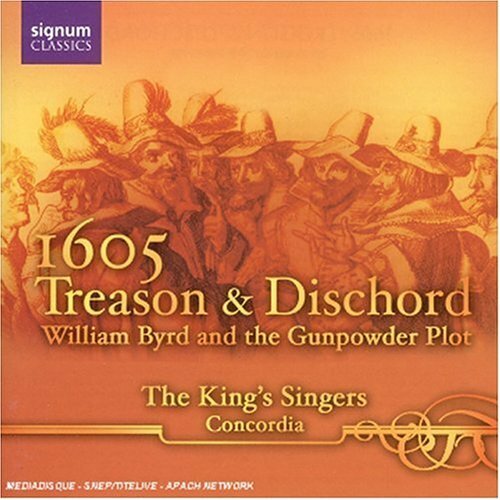 400 years later the King’s Singers and Concordia illuminate the dangers of hearing Mass in secret, of conspiracy and downfall, and of protestant relief and celebration, through a project of music and prose. 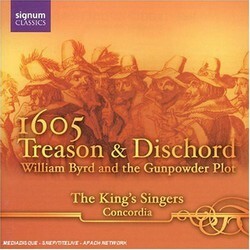 The music, structured around Byrd’s perfect 4-part Mass, contains motets by Catholic composers, balanced with protestant anthems celebrating the downfall of the plot, and a commission from the British composer, Francis Pott. Master Tresham: His Ducke reflects on the ‘9/11’ of its day - 5/11/1605. The script, drawing on historic texts and written by Deborah Mackay for the quatercentenary concert series related to this CD, uses the dramatized persona of William Byrd, the most famous composer of his age, to recreate the atmosphere of change and hope in the Jacobean court.